An engine house is a place where routine maintenance is done on railroad locomotives. The most familiar form is the roundhouse, although this type of structure is becoming less common in real life. Not all yards have engine houses, in fact, as more advanced locomotives travel greater distances without special attention, small engine houses are becoming less common, with most repairs being done at larger, centralized repair shops. 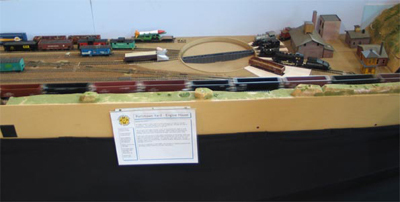 Small yards may just have a track where a locomotive can be parked, while large yards may have facilities to handle fleets of locomotives, and to perform more difficult maintenance procedures. At a large railroad�s main repair shop, the most complex repairs can be performed, including complete rebuilding of wrecked or damaged locomotives. This yard is somewhere in the middle, with facilities for fueling locomotives and performing routine inspections and light maintenance. The engine house is located at the West end of Pottstown Yard. The ladder track is a near-mirror of the one at the opposite end of the yard.